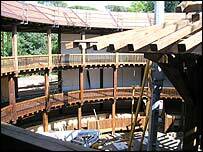 Berlin has taken the first steps in building a replica of the original Globe Theatre, at which many of Shakespeare's plays were first performed. A marker for the theatre was laid on the 440th anniversary of the birth of William Shakespeare. The replica 17th Century playhouse will be built on a wasteland between one of the last remaining pieces of the Berlin Wall and the river Spree. 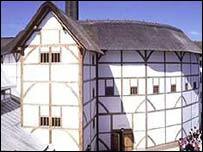 A first replica was opened in London in 1997, while a second Globe theatre opened in Rome last year. The area in Berlin was selected for its similarity to the riverside surroundings of the Globe Theatre in London, said architect Hans-Joachim Prast. The wooden, three-tiered construction will open in 2007 and will hold an audience of 750. It will have a sliding roof so that performances can take place all year round. "Berlin is a cultural centre, we have the most museums here and I see this project as a must for the city," said Mr Prast. The project will not be subsidised and will rely on sponsors to fund the initial costs of up to four million euros ($4.75 million). "Shakespeare is still very much alive today and I'm sure there will be no problems funding the theatre through ticket sales," said Mr Prast.